Treyarch has provided an update on what to expect in Black Ops 4 this week. With under eight days left before Operation: Absolute Zero is over, they’re ending this season off with a bang. 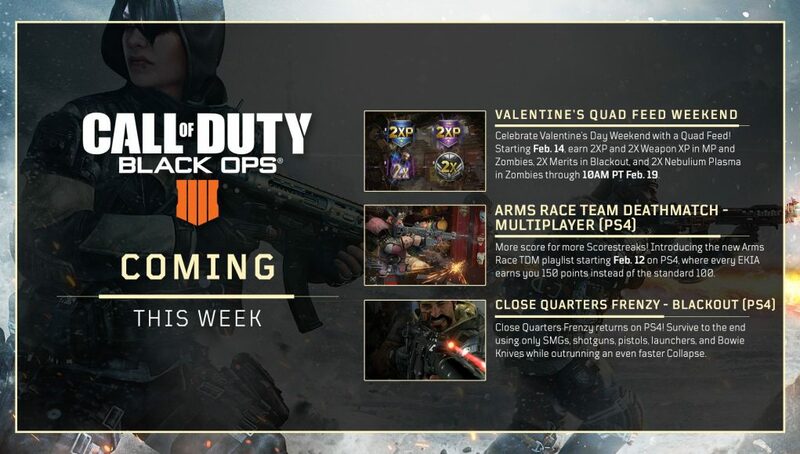 First up, players will get a special Valentine’s Quad Feed Weekend from 14 Feb. through 10AM PT 19 Feb. Remember, Quad Feed is 2XP and 2X Weapon XP in MP and Zombies, 2X Merits in Blackout, and 2X Nebulium Plasma in Zombies. Next up is the addition of Arms Race Team Deathmatch to PS4. In this mode every EKIA grants you 150 points rather than 100, so expect tons of Scorestreaks in the air and on the ground. Rounding out the bunch is the return of Close Quarters Frenzy for Blackout on PS4. This limited time game mode features a faster collapse and restricted weaponry to SMGs, Shotguns, Pistols, Launchers, and Bowie Knifes. Lastly, Treyarch also confirmed that they will provide a preview of the next Operation and upcoming content for all modes.